MessagEase's design stems from several years of scientific research, the results of which were presented at the sixth International Conference of Multimodal Interface (ICMI-2003) in Vancouver, Canada, last month. (http://exideas.com/ME/ICMI2003Paper.pdf). This design uses an ingenuous yet intuitive system of taps and slides for entering full text-taps for most frequent letters and slides for the rest, making its keyboard compact but with keys larger and easier to target than the soft QWERTY keys. "Text entry is the weakest link for a Tablet PC. The QWERTY keyboard is designed for ten fingers not one finger or one stylus. Pecking tiny QWERTY keys is a very arduous task, frustrating Tablet PC users" said Saied Nesbat, Ph.D., President and CEO of ExIdeas. "MessagEase keyboard takes only a small area of the screen yet sports larger keys to make browsing, using a spreadsheet, and even serious writing fast, easy, and accurate"
MessagEase Onscreen Keyboard essentially uses 9 keys, yet it enters all letters, numbers and special characters. It also includes Alt and Ctrl keys, function keys, all cursor navigation keys, as well as keys for common editing functions (Cut, Copy, Paste, etc). Especially designed for tablet computers, MessagEase Onscreen Keyboard can be resized or made transparent to fit any need. Smaller keyboards minimize the real estate occupied and optimize the stylus movement, while larger keys can be used for text entry with thick or gloved fingers. The transparent keyboard lets you see the text you type behind it, further optimizing the use of the screen area. MessagEase technology is also available for PDAs and is applicable to cell phones (demo available today), TV remote controls, watches, car navigation systems, or any small device that cannot accommodate a ten-finger QWERTY keyboard. Currently MessagEase enjoys a substantial and growing number of dedicated users among Pocket PC and Palm PDA owners. To date more than 300,000 copies of MessagEase products have been downloaded and more than 1500 users have joined its Yahoo users group. Fast: User study and Fitts' Law analysis support 67% to 200% speed improvement. Easy to learn and operate: 90% of our current users became proficient in less than a day. Full function, navigation and editing keys: Alt, Ctrl combinations, Start, Menu, F1-F12, as well as cursor keys, Home, Page Down, etc., are available directly from the keyboard. Common editing functions (Cut, Paste, Copy, Undo, Redo, Select Al, etc.) are also available directly from the keyboard. Small footprint: The keyboard is much smaller than the QWERTY keyboard, but the keys are about three to five times larger! 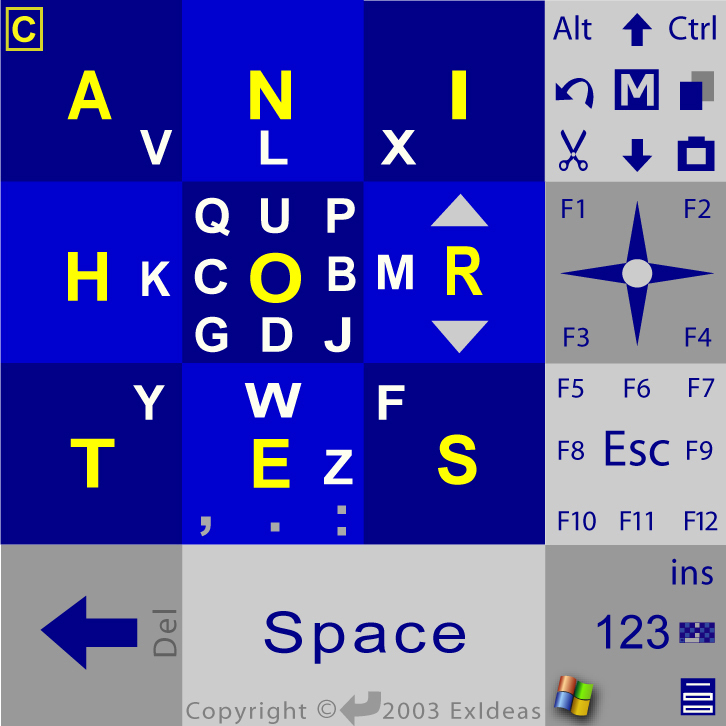 Resizable and Transparent: The entire keyboard can be resized to fit the need, or to minimize the screen area used. It can be optionally made transparent to further optimize screen real estate. MessagEase Onscreen Keyboard runs on any Windows system. It works with passive or active screen sensing technology; it can be operated with a stylus or a finger. The MessagEase for Palm runs on any Palm OS device; also supports high resolution on devices such as Sony Cli� NR, NX or NZ. It is Compatible with hard-key (i.e. cell phone style) as well as soft-key (i.e., PDA or Tablet PC style) devices. It provides a cross-platform text entry solution for any small mobile device. MessagEase letters are assigned based on exhaustive simulation to optimize text entry speed and to minimize stylus or finger movement. This optimization was performed using Fitts' law and di-gram frequency data derived from on a large body of text http://exideas.com/ME/ICMI2003Paper.pdf). The proprietary technology is inexpensive and easy to implement. The core C++ or Java code can be used to speed up implementation for new devices. It is ideal for a wide range of applications ranging from consumer to industrial and military. Implementing MessagEase requires no specialized or additional hardware. MessagEase design conforms to the existing form factors any small device. 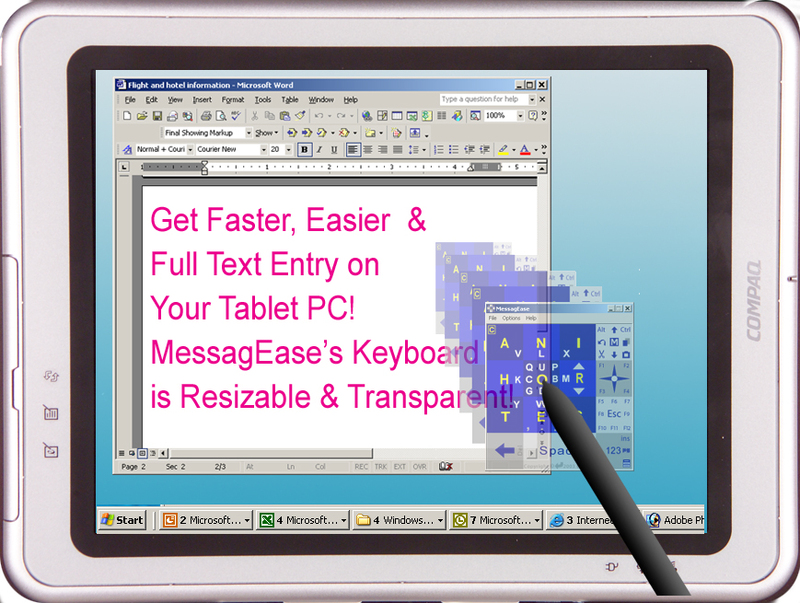 MessagEase Onscreen Keyboard for Tablet PC and Windows will be available for purchase in January of 2004. Its unit price is set at $29.95 with discounts available based on volume. Currently Palm OS and Pocket PC versions of MessagEase are available from company's website as well as many software download sites. The price for the Palm version is currently set at $22.50 and the Pocket PC version sells at $19.50. A privately held California company, ExIdeas specializes in Computer-Human Interface and is committed to user interaction innovation for the emerging mobile devices. Free evaluation copies of ExIdeas' current products can be downloaded from its website: http://www.exideas.com.